my book store: What’s the name of the tallest mountain in the world? What’s the name of the tallest mountain in the world? 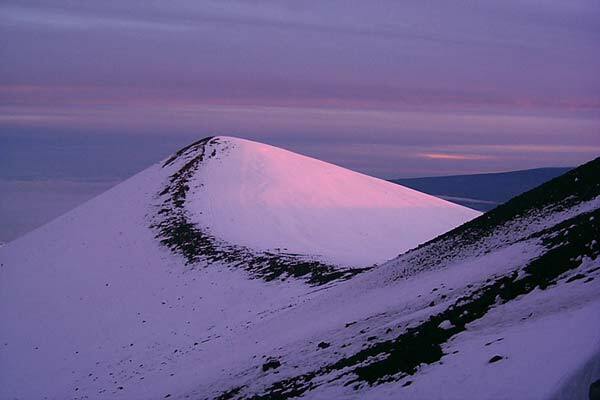 Mauna Kea, the highest point on the island of Hawaii. The inactive volcano is a modest 13,799 feet above sea level, but when measured from the seabed to its summit, it is 33,465 feet high about three-quarters of a mile taller than Mount Everest. As far as mountains are concerned, the current convention is that “highest” means measured from sea level to summit; “tallest” means measured from the bottom of the mountain to the top. So, while Mount Everest, at 29,029 feet is the highest mountain in the world, it is not the tallest. Measuring mountains is trickier than it looks. It’s easy enough to see where the top is, but where exactly is the bottom of a mountain? For example, some argue that Mount Kilimanjaro in Tanzania—at 19,340 feet—is taller than Everest because it rises straight out of the African plain, whereas Everest is merely one of many peaks topping the enormous base of the Himalayas, shared by the world’s next thirteen highest mountains. Others claim that the most logical measure ought to be the distance of a mountain’s peak from the center of the Earth. Because the Earth is a flattened rather than a perfect sphere, the equator is about thirteen miles further from the center of the Earth than the poles. This is good news for the reputation of those mountains that are very close to the equator—like Mount Chimborazo in the Andes—but it also means accepting that even the beaches in Ecuador are higher than the Himalayas. Though massive, the Himalayas are surprisingly young. When they were formed, the dinosaurs had been dead for twenty-five million years. In Nepal, Everest is known as Chomolungma (Mother of the Universe). In Tibet, it is called Sagamartha (Forehead of the Sky). Like any healthy youngster, it is still growing, at the not very exciting rate of less than a quarter of an inch a year. from "The General Book Of Ignorance"
Where is the driest place on earth?